Dr. Seth Ammerman listens intently to his new patient. Ernesto, who does not want his last name disclosed, is homeless. Ernesto is earning a high school degree and working part time, but at night, he and his brother share a tent that they set up on San Jose streets. The daily stress of being homeless is wearing Ernesto out and making him light up too many cigarettes. That's why Ernesto walked into this mobile clinic parked just a few steps away from his classroom at the San Jose Conservation Corps & Charter School. He's sitting in a fully equipped exam room inside a shiny blue tour bus with Wi-Fi and the ability to get HIV test results in 20 minutes. During the consultation with Ernesto, Ammerman nods sympathetically. 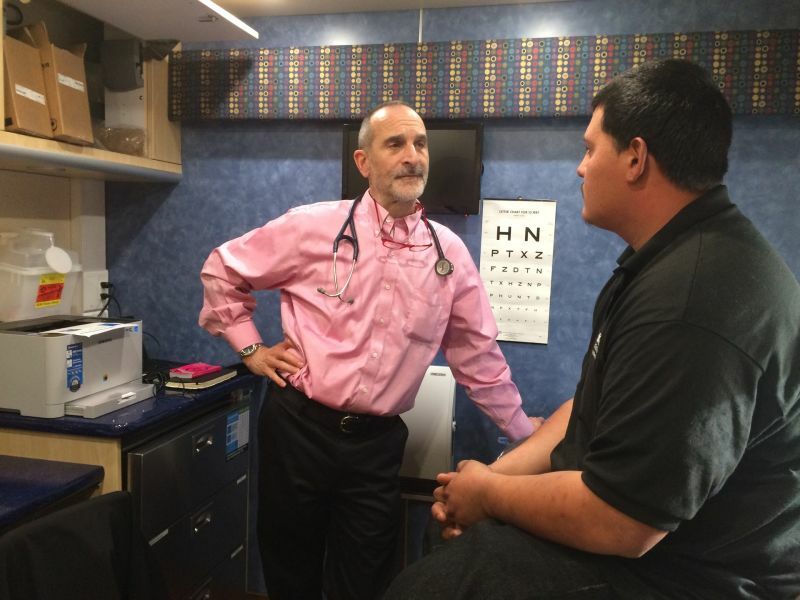 In his 20 years working in this teen health van, Ammerman has treated thousands of uninsured and homeless adolescents ages 24 and under. Twice a week, Ammerman and two nurses park the clinic at continuation high schools and other places frequented by at-risk adolescents in Santa Clara, San Mateo and San Francisco counties. 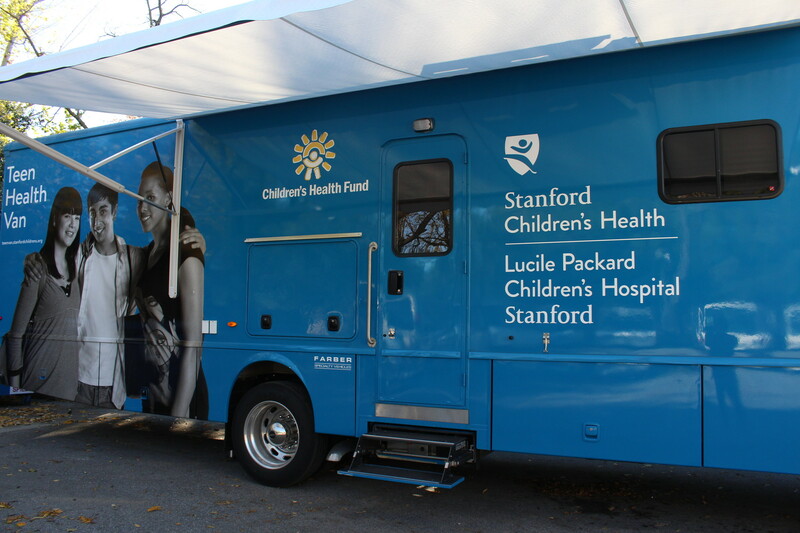 The van is a community project of the Lucile Packard Children's Hospital Stanford and Children's Health Fund, with support from Samsung. The team provides free medical, nutrition and mental health services, including reproductive health care and treatment for chronic illnesses, substance abuse and depression. All medications are free and provided at the time of consultation. A social worker is available for counseling and connects adolescents to additional resources; a registered dietitian works with patients who are malnourished, a frequent health issue for this population. Some of the 400 patients who visit the teen health van each year have never seen a doctor, says Ammerman. For many patients here, the teen health van can become a trustworthy and reliable place in an otherwise unstable world. Grace Kim first set foot in the van 10 years ago when she was 17. She admits she was skeptical. "Because it was a van, and I wasn't really sure what they could really provide for me," says Kim, 27. "Off the bat I don't trust people very easily and that probably comes from the territory that I grew up in." Kim, a second-generation Korean-American, says she grew up with abusive relatives in a house "full of conflict." By the time she was 14, she had already attempted suicide. With the help of a high school counselor, Kim moved out of her parents' home into a transitional living program, which required her to get medical checkups at the van initially. For the next four years, Kim was a regular patient. Grace Kim credits the teen health van with helping her overcome depression and other health issues when she was 17. Kim was photographed near Santa Clara University, where she is a master's student in counseling psychology. Ammerman and other staff at the van treated Kim's malnutrition, substance abuse and other health issues. They connected her with free visits to see a psychiatrist at Stanford Medical Center who treated her depression, and she thrived. "If I didn't get that help, I would probably be in a very bad place," says Kim, now a master's student in counseling psychology at Santa Clara University. "The whole mental health aspect of it was probably the most beneficial, probably the most powerful." Today, Kim facilitates a support group for suicide survivors at Santa Clara Valley Medical Center and says her passion for her work comes from those dark days in her past. She still keeps in touch with Ammerman, calling him once in a while with health-related questions. "I trust him absolutely with everything because he's seen me at my worst, and he still to this day has the most faith in me," says Kim, adding that Ammerman motivated her to take care of herself and do better. "To have someone care for you and tell you that you can get better and do anything that you put you heart into. ... I mean, there are no words for that." Kim recognizes she was lucky to have access to housing, medical and mental health resources, but that may not be true for others. Over 40 percent of Stanford's teen health van patients are homeless, says Ammerman. These are adolescents up to age 25 living on the streets, in cars and, most commonly, overcrowded apartments. While doubling up with relatives or friends may sound like housing, it's not stable because people can be asked to leave at any time. Ammerman says he's seen a significant increase in this population of teens and young adults -- those living in overcrowded conditions -- since 2008. Working families unable to make rent are more likely to end up in these challenging conditions. "We are seeing, unfortunately, more homeless kids. And that's really due to the housing crisis that we are all aware of here in the Bay Area," says Ammerman. Statewide, the rate of homeless public school students in grades K-12 jumped by one-third in just three years -- from 3.6 percent in 2011 to 4.8 percent in 2014. More than 86 percent of the nearly 300,000 homeless public school students statewide are living doubled up with friends or relatives. "So it's a very unstable housing situation, and that is always problematic for your health," says Ammerman. Children and youth facing homelessness or housing insecurity are more likely than their peers to face chronic illness and mental health problems, as well as traumas and safety risks, studies show. Shahera Hyatt directs the California Homeless Youth Project at the California Research Bureau in Sacramento. She supports Ammerman's experience as to why the state is seeing a lot more child, youth and family homelessness. "We know that housing affordability is in crisis proportions," says Hyatt. "In many communities across the state there's rapid gentrification happening and a very low housing stock." Homeless youth -- particularly those constantly on the streets or without any access to shelters -- risk sexual abuse, police harassment and substance addiction. Yet the state is woefully lacking in services and resources for this population, says Hyatt. Sacramento has a single six-bed transitional housing center for young adults -- and a nine-month waiting list of about 100 people, says Hyatt. She added that two-thirds of the state's counties lack shelters and other basic services for homeless youth. "There’s a lot of mythology about why young people become homeless ... that they are unruly or want to live outside. But that's not true," says Hyatt. "A lot of these people are really disenfranchised by the lack of services out there and become homeless." Since 1988, California has spent $1.1 million annually on programs that serve homeless youth: the Homeless Youth and Exploitation Program and the California Youth Crisis Line, according to the California Coalition for Youth. A bill introduced last month by Assemblywoman Young Kim, AB1699, would provide $25 million in funding for homeless youth emergency service projects. The bill's first hearing should be in the next two months, according to Bryan Shroyer in Kim's office. Meanwhile, mobile health clinics like Ammerman's in San Jose continue to fill a gap in access to care for uninsured youth. That model of delivering care directly to underserved populations has been gaining popularity nationwide. In the last two decades, the number of mobile clinics has grown to about 2,000 throughout the country, according to the Mobile Health Clinics Association. "What we are seeing is greater acceptance that mobile care can be really high-quality care," says Dr. Delaney Gracy, chief medical officer with the Children's Health Fund. "More people are realizing that mobile health is an important part of safety net care." 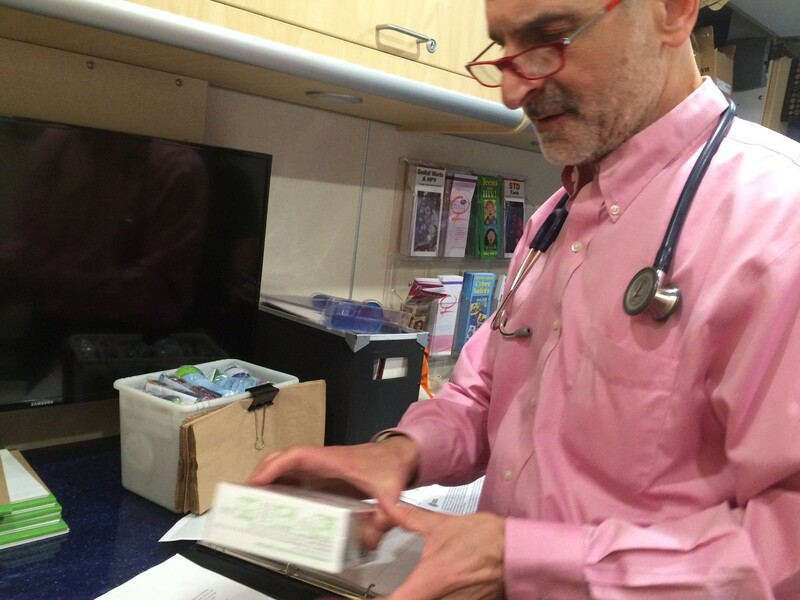 At the teen health van's exam room, Ammerman is ending his consultation with Ernesto by handing him packages of nicotine gum, the medication Ernesto chose from several options to help him quit smoking. Before Ernesto leaves, Ammerman has one last question for first-time patients like him. "We literally ask each kid, 'What are you good at, what are your strengths?' And they're shocked at this question because no one's ever asked that before," says Ammerman. When Ernesto's turn comes to answer, he thinks for a while before responding. "Um ... I like to work and stay busy," says Ernesto. "And I motivate my brothers a lot, as much as I can." "Cool! That's a really cool thing," responds Ammerman. As his patients successfully take steps to care for their health, says Ammerman, they also gain the confidence to tackle other goals, like getting steady housing. "These kids have strengths, and by focusing on their strengths it can really make a difference. Because strength builds strength. And success builds success," says Ammerman.